A recipe so good, it deserves its very own blog post! So as I start this and when I reflect on my background and history with cooking (and now the deep dive into food blogging), I think back to one of my very favorite food experiences. I remember it like it was just yesterday...the first time I ever had gnocchi. And maybe this remembrance so strong because I pronounced “gnocchi” totally wrong and needed an entire explanation about what it was from the waitress... either way, it was my 25th birthday dinner at Frasca Wine Bar in Chicago and I’m not exaggerating when I say that I would do it all over again if I could. The soft pillowy texture and creamy yet not-overly-heavy sauce had me hooked instantly ...the wine and dreams of dessert to come helped obviously, too. From there, I’ve always sought out to prepare the best and most delicious homemade version of this recipe. In my opinion, gnocchi is one of the easiest homemade pastas to make and can also be some of the most versatile to do so (correct me if I’m wrong, I’m definitely not super well versed in this practice!). I like to eat it plain, with protein, over salads (yes, salads! ), with stir-fry’s and now, combined into soups! 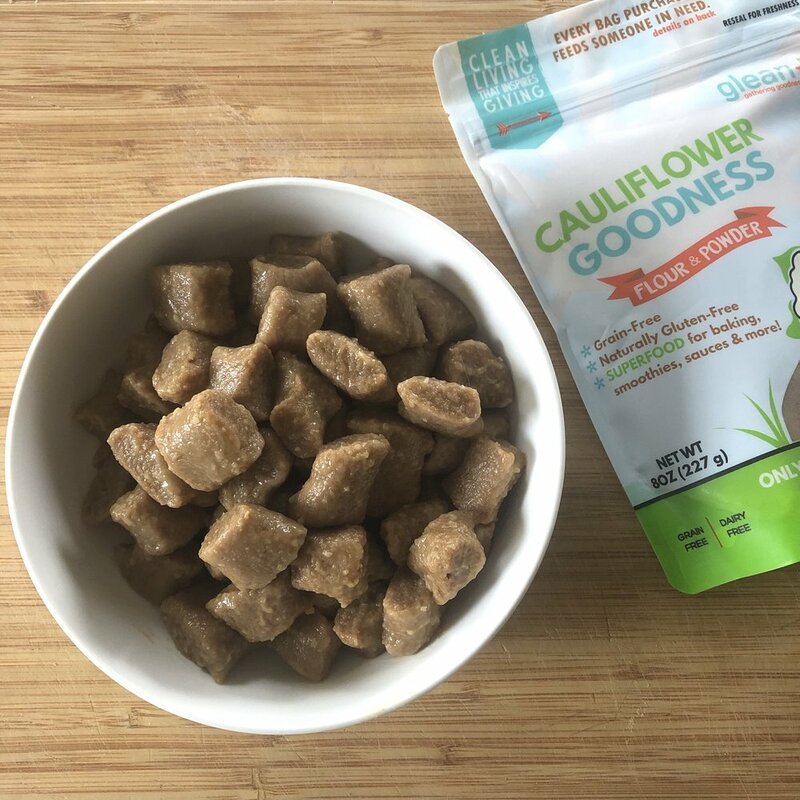 When Trader Joe’s recently released and wowed everyone with their cauliflower gnocchi, I knew I had another challenge up my sleeve…! - Prepare the gnocchi. Bring a large pot of lightly salted water to a boil. Place all ingredients except for the cheese into the Ninja System Food Processor and blend until smooth. You may want to add more AP flour as you go to get the dough to a kneadable consistency. At this point, you can fold the cheese evenly throughout. Then, separate dough into about four equal portions. On a lightly floured surface, roll out each portion into 3/4" diameter tubes. Cut the tubes of dough into about 1" pieces. Carefully drop gnocchi into the boiling water in small batches and cook for 3-5 minutes, or until the gnocchi has risen to the top. Continue until all gnocchi has been cooked. Drain and set aside. - Prepare your veggies for the soup by placing roughly cut onion and celery into the Ninja System Food Processor and chopping until evenly processed into small pieces. To make the soup even heartier, you could also include carrots or parsnip to the mix. - Next, add the cauliflower flour + water mixture, evaporated milk, prepared gnocchi, kale, and tomatoes. Stir, allow greens to wilt a bit. Warm and cook for another 30 minutes – 1 hour until soup has thickened. 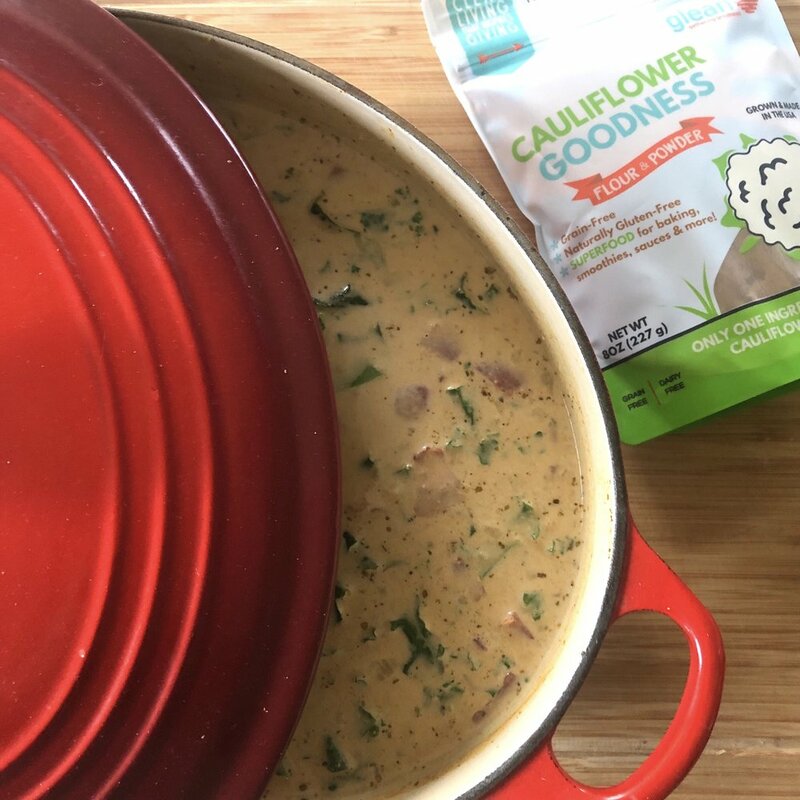 At this point, add any additional cauliflower flour/water mixture as needed if you want a creamier soup and cook longer over low heat. Season with salt and pepper, as desired. Ladle into bowls and serve with fresh parsley!